If I had one wish that I could wish this holiday season, it would be that all the children to join hands and sing together in the spirit of harmony and peace. If I had one wish that I could wish sometime soon, it would be to have all three of my animals curl up together in a cozy little mound of fur. But this is as close as I'll get. 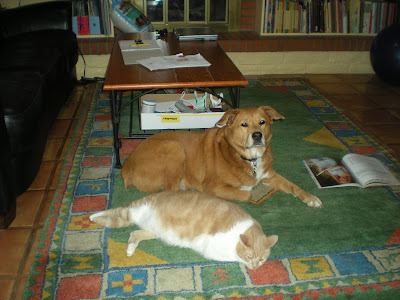 be happy in your house dog plus cat does not equal war! I know it would be nice, but sometimes you just got to take it one - or two - at a time!